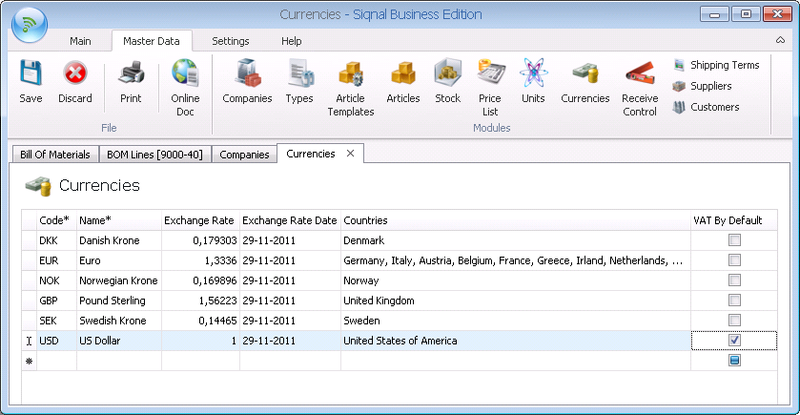 Currencies is used to register a list of currencies available in various modules as dropdown lists. In the module Suppliers for instance, the default currency of a supplier is set and is then used as the default currency in the Purchases module (can be overruled). Code*: International currency code - mandatory field. Name*: Name of the currency - mandatory field. Exchange Rate: Is used for calculation on modules like Quotes, Orders, Inquiries and Purchases to ensure that all prices on the modules Stock, Articles and Price List always are in company currency. Countries: Countries using the currency - optional field. The field is not used outside the Currencies module and is used as a comment field to keep track of countries already covered. VAT By Default: If a customer currency on a quote or an order is the same as company currency and VAT By Default is marked for this currency, the VAT is then calculated automatically on quotes or orders.